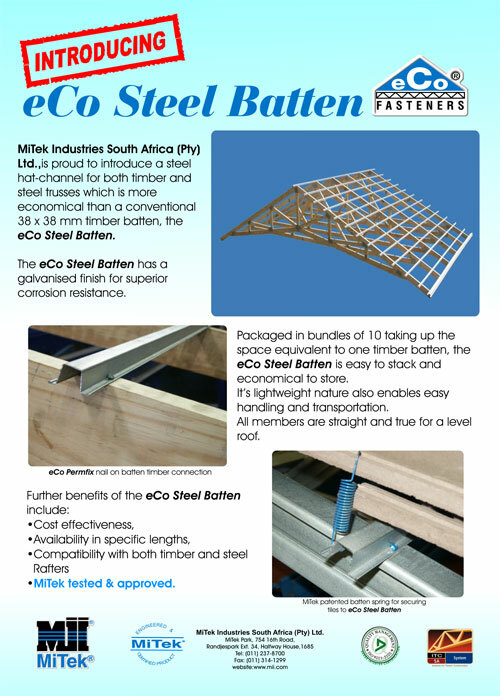 MiTek specialises in the manufacturing and sales of all types of metal fasteners for timber, e.g. 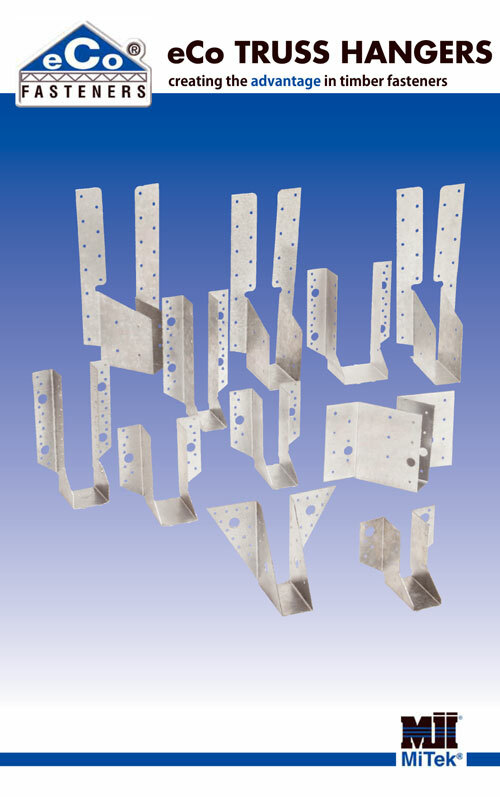 galvanised steel connector plates for the prefabricated timber roof truss industry. 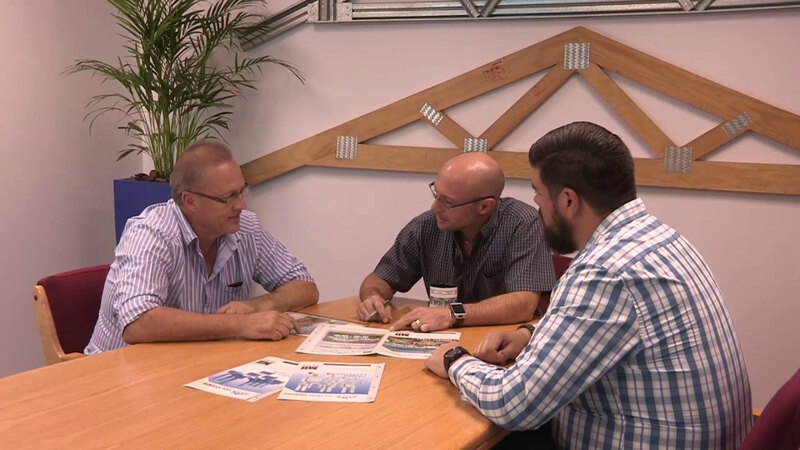 MiTek also supplies connectors to the building, mining and timber frame housing industries. The low mass per m2 (between 2-10kg) of this roofing system ensures both savings on the supporting structure as well as on transportation and erection costs whilst also being vermin proof and non-combustible. Large sections of the roof can simply be pre-assembled on the ground and hoisted into position on the walls – making this one of the most viable systems with a large range of applications up to a clear span of 40m. 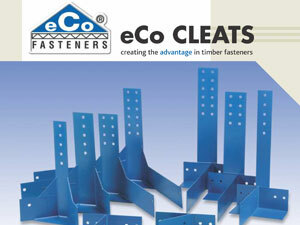 Eco Heavy Duty type H Cleats are designed to ensure sound connections at truss and girder junctions. These cleats can be specified in a variety of different configurations to suit different loads and structural arrangements. 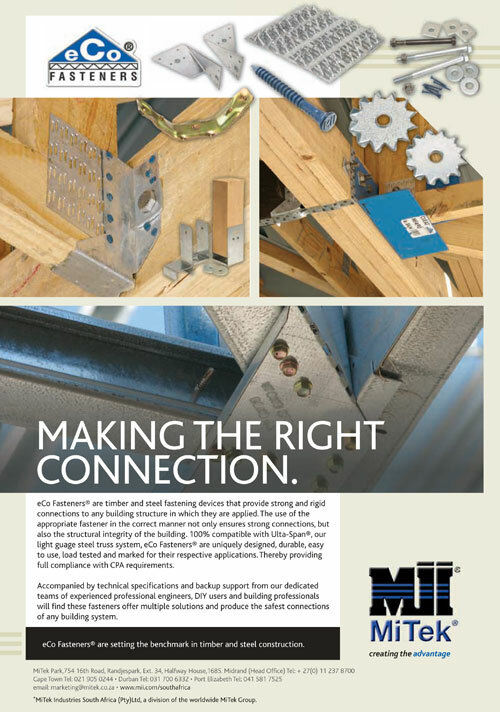 The MiTek Wall Tie is a holding down component devised to anchor timber roof trusses, rafters, beams or steel roof trusses to the wall. 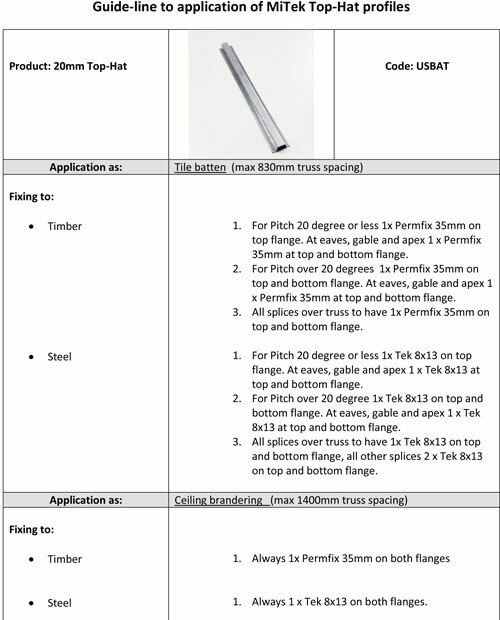 Guide-line to application of top-hat profiles as tile batten, ceiling brandering, runner, tilting fillet, purlin, runner or diagonal brace. 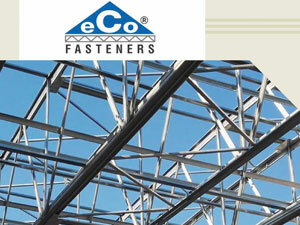 Prefabricated timber roof trusses. 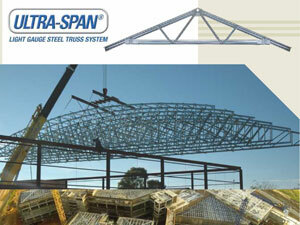 We also offer full size prototype truss testing as an alternative truss design method. 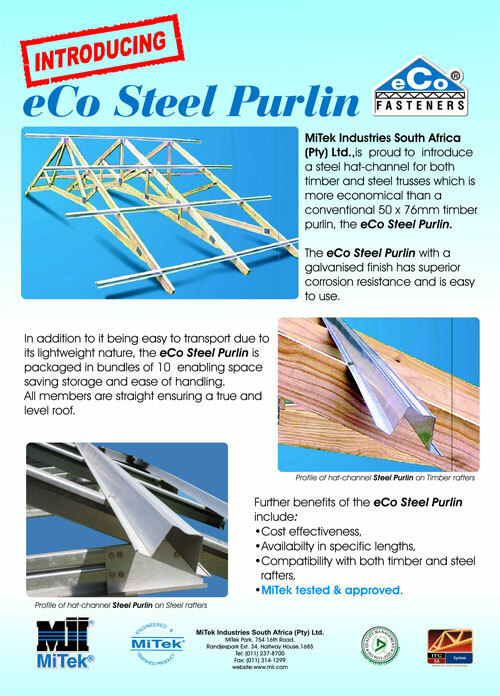 eCo Fasteners are timber and steel fastening devices that provide strong and rigid connections to any building structure in which they are applied. 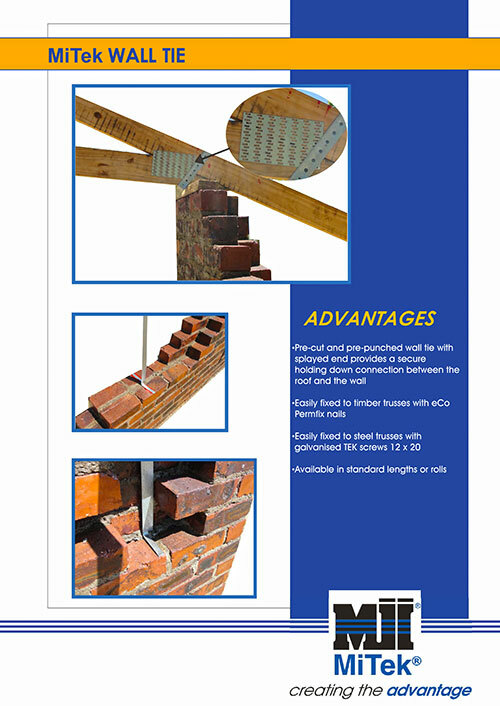 The use of the appropriate fastener in the correct manner not only ensures strong connections, but also the structural integrity of the building. 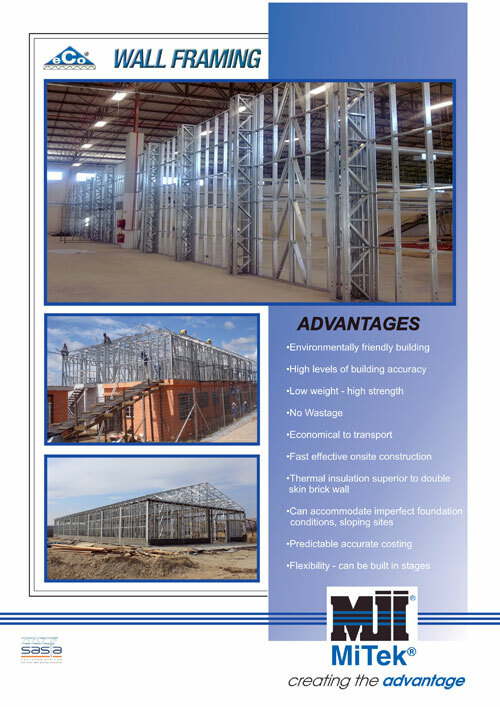 The light gauge steel wall framing system is flexible and cost effective. 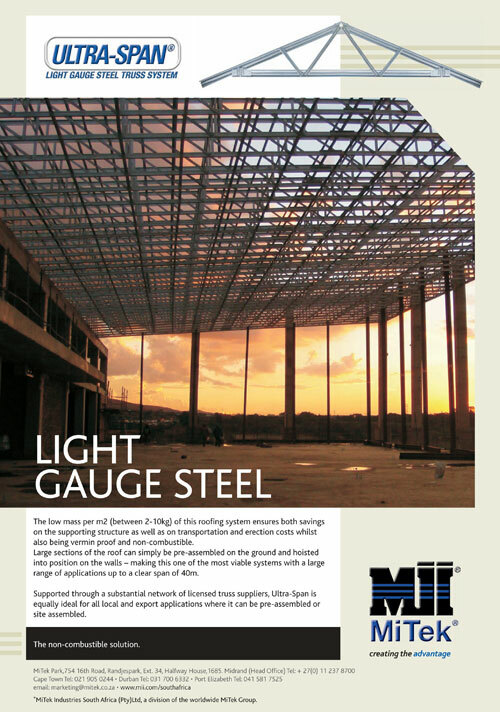 Offering the highest quality load bearing and non load bearing light gauge steel products. 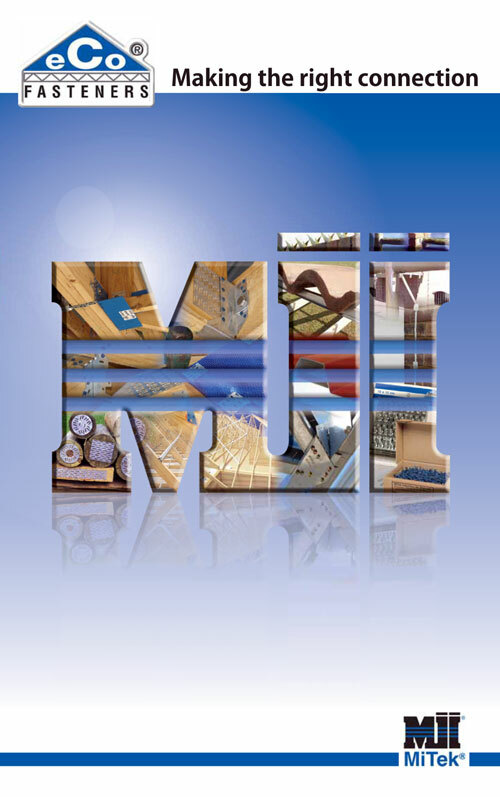 Mitek is a fully integrated designer and manufacturer of framing solutions addressing both the commercial and residential markets. The low mass per m2 (between 2-10kg) of this roofing system ensures both savings on the supporting structure as well as on transportation and erection costs whilst also being vermin proof and non-combustible. 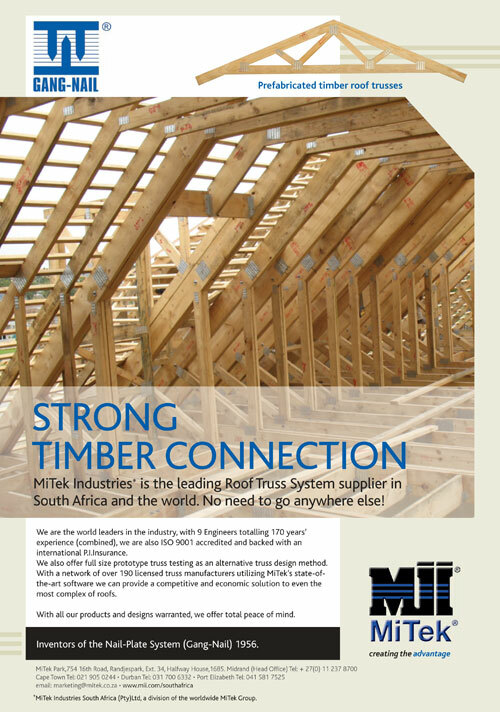 © 2019 MiTek Industries South Africa (Pty) Ltd. Portal powered by Specifile®.